Cotuí is a city in the Dominican Republic and is one of the oldest cities of the New World. It is the capital of Sánchez Ramírez Province in the Cibao. 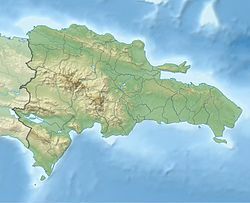 During the 1822–44 Haitian occupation, the city was officially designated as Cotuy. It was founded in 1505 by Rodrigo de Trillo for order of Nicolas de Ovando, who was the governor of Hispaniola. Cotuí was the name of an comunidad taína who governed the area. The city is well known for its gold, silver, iron, bauxite, marble and nickel mines, its rich soils and the largest artificial lake in the Caribbean, Presa de Hatillo. It is also known for its crystal clear rivers, and its caverns (prehistoric caves called Guácaras). It produces rice, plantains, cacao, pineapples, passion fruits, and yams. Cotui is also the hometown of Mets pitcher Duaner Sánchez and Milwaukee Brewers pitcher José Capellán. Other major towns near Cotuí in Sánchez Ramírez, are Villa La Mata, Fantino, La Cueva and Cevicos. ^ "Cotui Climate Normals 1961-1990". National Oceanic and Atmospheric Administration. Retrieved September 12, 2016.